Subscribe Now To Receive FREEYour Black Bucket Brew Magazine by eMail! Craft Beer and Food: Beer & food pairings, original healthy recipes using craft beer, entertaining with craft beer. Home Brewing: Extract with steeping grains, all-grain techniques, equipment, tested and approved original recipes, recipe development. Breweries: Tours, brewery owners, brewmeisters & their unique stories, business beginnings. Lifestyle: Beer & fitness, better blogging tips. 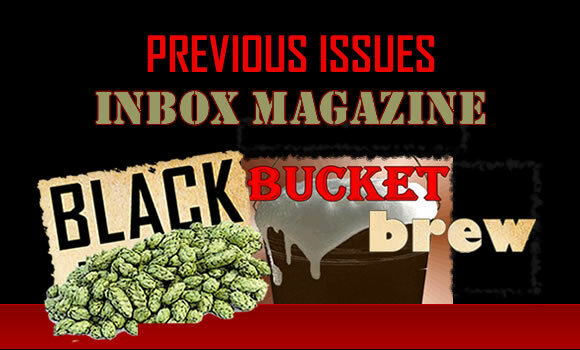 Subscribe Now To Receive FREEYour Black Bucket Brew InBox Magazine by eMail! Volume II, Issue 12, August 1, 2013: Beer Steins & Beer Cookies! Volume II, Issue 10, June 20, 2013: 7 Reasons Why! Volume II, Issue 8, May 2, 2013: Arrogant Beer? Volume II, Issue 7, April 4, 2013: Recycled Beer? Volume II, Issue 6, March 21, 2013: Spring Beer! Volume II, Issue 5, March 7, 2013: St. Patty’s Pride – Green Beer? Volume II, Issue 4, February 21, 2013: Blueprint for Beer? Volume II, Issue 3, February 7, 2013: The St. Valentine’s Day Beer Roundup! Volume I, Issue 24, October 25, 2012: The Great Pumpkin Mystery! Volume I, Issue 22, October 11, 2012: Bitter – is it Better? Volume I, Issue 20, September 27, 2012: Oktoberfest! Volume I, Issue 19, September 20, 2012: Honey, Honey, Honey . . . Ho-ney! Volume I, Issue 18, September 13, 2012: Cerveza Fiesta con Porky Tacos! Volume I, Issue 17, August 30, 2012: Road Trip Time! Volume I, Issue 16, August 23, 2012: Oysters ~ Oh, Shucks! Volume I, Issue 15, August 16, 2012: Put A Lid On It! Volume I, Issue 14, August 9, 2012: Have Your Wits ‘Bout You? Volume I, Issue 9, June 28, 2012: 4th of July BBQ Brew-a-bration! Volume I, Issue 7, June 14, 2012: Home Brew or Busted! Volume I, Issue 5, May 31, 2012: Take Flight with PubFood That Rocks! Volume I, Issue 4, May 24, 2012: This Ale’s For You! Volume I, Issue 3, May 17, 2012: Blue Ridge Brews & Chili Lime Beer Corn! Volume I, Issue 2, May 10, 2012: Special Today: Stout Pork Ribs! Volume I, Issue 1, May 3, 2012: BrewPub Now Open!